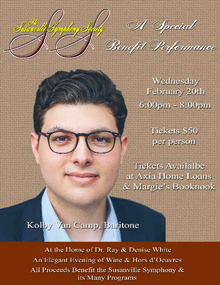 The Susanville Symphony Society will be hosting an intimate evening with Kolby Van Camp, renowned composer, vocalist and musician, as a fundraiser on Wednesday, February 20th. Van Camp is a nationally and internationally award-winning vocalist, chorister, and composer who is quickly building a reputation in the choral music world for his fresh compositions and unique performances. He is also an award winning vocalist and pianist, having placed in numerous regional, national, and international competitions. The elegant evening performance will take place at the home of Dr. Ray and Denise White and will feature wine and hors d’oeuvres with all proceeds benefiting the Susanville Symphony and its programs.